This new tube microphone has a unique continuously variable pick-up pattern. So it is possible to adjust any necessary directional characteristic in the range from omnidirectional to hypercardioid and to figure-of-eight. All electronics is mounted inside a heavy brass body, which eliminates a possibility of internal resonances. The preamp schematic is based on the vintage hand selected triode EC92. High-quality transformer provides minimal distortion and a high overload capability. 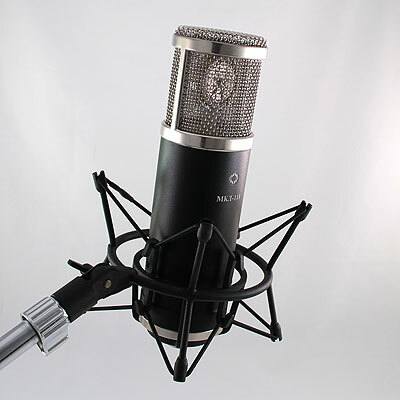 The MKL-111 could be the only mic you need for miking up a full drum kit. The clarity of the top end with colour added by the tube circuitry of this mic will give a wonderfully detailed full and rich sound. Each drum and cymbal should come through clearly and brightly. For the simplistic approach the sound created by this set up is unmatchable even with hours of experimentation on mic placement and application suitability with a bunch of other mics. Place the MKL 111 about 1.5 foot above the level of the highest cymbal with the stand about 2 foot behind the drummers stool and face the mic angled down towards the centre of the kit. "... Gerade bei Sprach- und Gesangsaufnahmen offenbart das MKL-111 einen sehr angenehmen, warmen aber direkten und ehrlichen Sound, der sich jederzeit mit den High-End-Mikrofonen anderer Hersteller messen kann, die teilweise noch um einiges teurer sind. Vor allem die Sauberkeit des Klanges verblüfft mich hier total. Bei der Akustikgitarrenaufnahme kommt es natürlich in erster Linie auf die Positionierung am Instrument an, aber hat man die richtige Position erst gefunden, ist der Sound genial. Reichlich Volumen im Low-End-Bereich, aber auch die seidig-weichen hohen Frequenzen können überzeugen. Im mittleren Bereich des Frequenzspektrums, gerade im Attack-Bereich der Stahl-Saiten, hat dieses Mikrofon eine sehr gute Zeichnung..." "...Especially in speech and vocal recording reveals the MKL-111 a very pleasant, warm but direct and honest sound that can always compete with the high-end microphones of other partially much more expensive brands. Especially the cleanliness of the sound stunned me here totally. When recording acoustic guitar, it is of course the positioning of the mic at the instrument very important. But after finding the right position the sound is awesome. Plenty of volume in the low-end range, but also the silky-smooth high frequencies can convince. In the middle range of the spectrum, especially in the attack portion of the steel strings, this mic has a very good figure..."